Sunday School begins September 16 and runs till May 2019. Classes are held in the lower level of the church. Students range in age from 3 year old through 6th grade. We normally hold an adult Bible study following refreshments and snacks at 10:30 a.m. in the fall and winter. Its held in the little chapel adjacent to the worship center. Small groups meet in member homes regularly. This allows us to grow in His Word and build on our internal relationships with each other and the community. Several HOME groups are available to join and to build relationships with fellow BLC members! If you are interested in being a part of HOMES or have any questions. Please contact Ruth Rose jrrj0312@earthlink.net or contact the church at 262-968-2194. Welcome to the Bethlehem Family Bible Study Gatherings. Join us for one of our great Bible Study Gatherings! 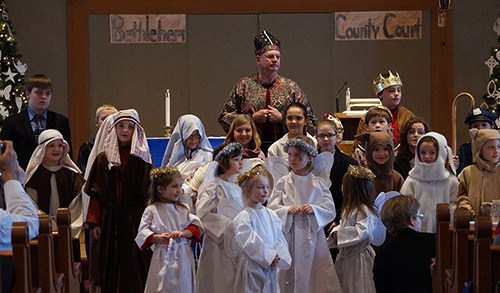 Confirmation in the Lutheran Church is a public profession of faith prepared for by careful instruction in the six chief parts of Martin Luther's small catechism. It is called "affirmation of baptism", and is a mature and public reaffirmation of one's faith. Confirmation lasts for about two years. Classes begin September 17th, 2018 for grades 7th and 8th, and currently meet at 4:15 p.m. on Mondays. Contact Pastor Russ for more information at 715-491-6894. Men meet every 2nd and 4th Tuesdays at 9:00 a.m. Whether you are a member of Bethlehem or not, these Bible studies will bring you closer to Jesus and to understanding His word. Please join us. Men meet on the 2nd and 4th Saturdays at 7:00 A.M. The power of men in Christian fellowship cannot be overestimated as a dynamic discipleship tool. We enjoy fellowship, study, and breakfast. Please join us. Contact Ross Johnson at rcjohnson4020@twc.com. room. We enjoy socializing and sharing refreshments as well as studying God's word. Contact Pat Engen for more information at dnpengen@centurylink.net. Women attend meetings periodically as well as attend the yearly convention. Please contact Pat Engen for more information at dnpengen@centurylink.net.